In her recent lecture on dictionaries, Erin Mckean likened the task of the lexicographer to that of a fisherman dropping an enormous net into a sea of language, and collecting with wonderment the words that surface. If that is a good analogy, then surely one of the world’s most interesting and eclectic fishermen is bestselling author Adam Jacot de Boinod. In 2005, after a chance encounter with an Albanian dictionary sparked his curiosity, Jacot de Boinod combed through nearly 300 dictionaries from around the world to compile his bestselling book, The Meaning of Tingo: And Other Extraordinary Words from Around the World, which was featured in an article on the BBC News, here. 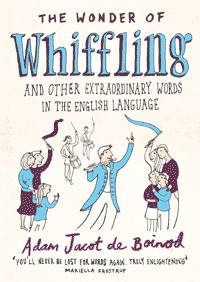 Now, he is focusing the hunt on the English language with a new book titled The Wonder of Whiffling, And Other Extraordinary Words in the English Language. It’s particularly exciting that the author has opened up the research for the book with a call for submissions through a new Twitter account, Whiffling Twitter. So, if you have a favorite rare English word or phrase, drop it into the net.